yes the answer key, analysis of CSAT 2013 will be uploaded, Work in process. Coming to the topic of this article: reading Hindu online, keeping track of other important websites and shifting from google reader to feedly. What to read in pib.nic.in? Where do I get more RSS-list? One the biggest worries of every UPSC aspirant: Hindu not available in my city, what to do? Send subscription money to TheHindu, mentioning your name and address. they’ll send paper. Problem: paper doesn’t come every day. Usually postman will throw 3-5 days’ papers at once. Send money. Hindu lets you access their e-paper edition online. Problem: not convenient on small screen monitor / low-speed internet. Problem: not as convenient as reading a convention “paper” newspaper. You’ve to do lot of clicks! Even if you’re getting physical “paper” of Hindu newspaper, there are still some goods websites like pib, idsa, PRSIndia that you should follow for exam preparations. Here RSS-feeds came handy. But from 1st July, Google reader will be shut down. Reasons: declined users, expenditure, privacy laws. There are plenty of alternatives to google reader : standalone software, desktop widgets, browser plugins. You can try out a few and decide whatever you’re comfortable with. After wasting few days in trial n error, I’ve settled with “Feedly” (it is an extension/addon for chrome and firefox browsers. Even available for android tablets and iphones.) and yes of course free, legit and safe. User friendly drag-n-drop features. 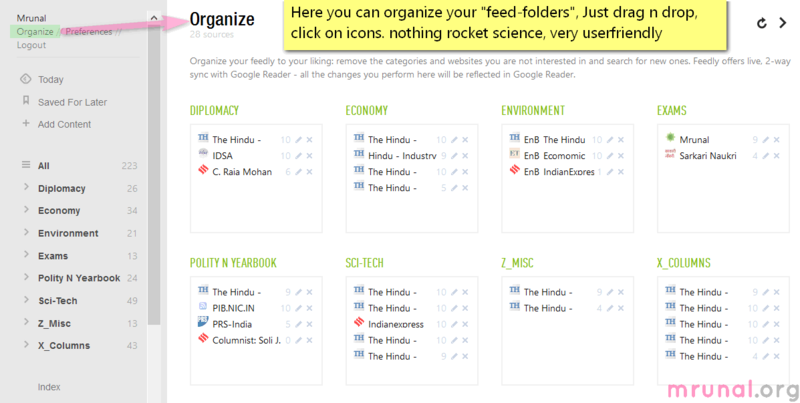 Organizing feeds is even easier than in Google reader. If you’re using evernote, feedly has button to directly integrate stuff in it. Very aesthetic theme and responsive layout. ~14 lakh chrome users and ~2.5 lakh firefox users already installed it. Prominent tech websites and tech-bloggers recommend it, hence unlikely to go out of business soon. In this article, we’ll see how to shift to feedly and how to optimize it for exam preparation. First you’ve to install feedly extension in your browser. 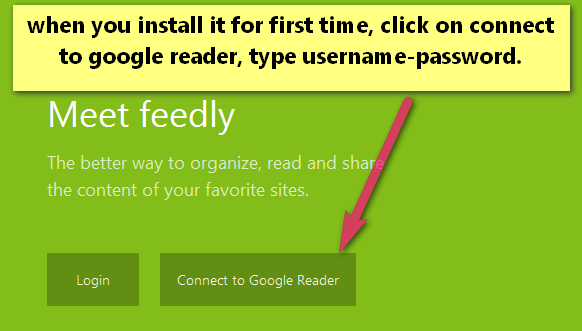 Once you install, a green page asks you to either login or connect to google reader. Since you’re using it first time, click on connect to google reader. New window pops up, type of google reader username-password, which is same as you gmail username password. 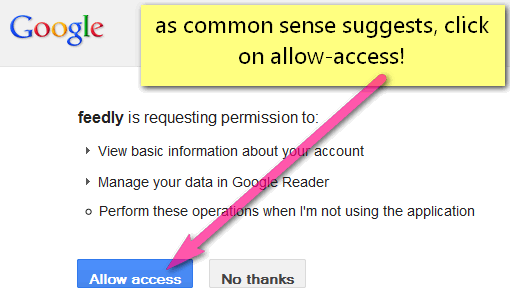 Another new window comes, click “allow Access” and rest will be taken care of automatically. 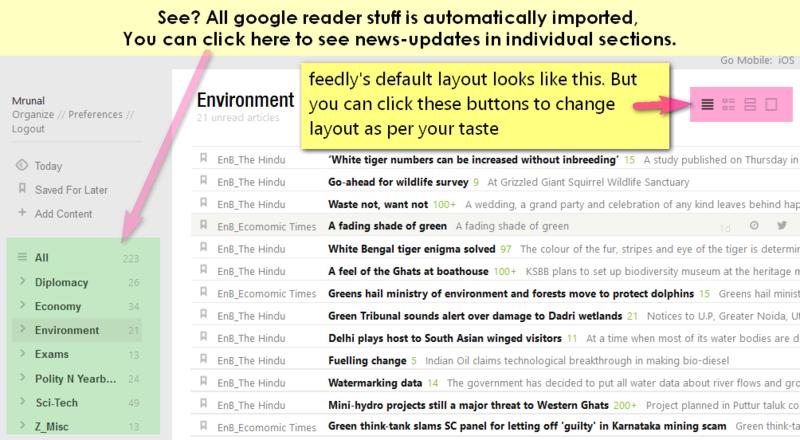 on the left hand corner, feedly displays your name, and three buttons “organize, preference, logout” click on organize. you get a window like this. Use drag n drop and various icons to arrange your feeds into various categories. A new tab will come, save the RSS feed subscriptioin approrpriate category or create a new category then save. By the way, always keep habit of classifying news and notes whether you read it online or do it via physical paper. A bigger picture will emerge after 2-3-5-7 months, when the individual pieces start fitting in the bigger picture especially for diplomacy/International relations and economy. Here is the list of RSS-feeds that you should consider adding (if you already had google reader then these feeds will be already displayed in your feedly, just a few minor changes in URLs for certain sites). Following list is not exhaustive or sacred, use it as per your taste and requirements. Note: C Rajamohan writes for Indianexpress, provides decent fodder points on India-China, India-US and India and its neighbors. IDSA website also covers many goods areas/topics of international relations. Why follow three sites? Because UPSC getting obsessed with EnB, so you don’t miss out any ‘good-stuff’. Besides these sites don’t upload dozens of EnB news everyday. So reading load is not becoming very high. Note: The Hindu also gives RSS-feeds for Stock-quotes and markets but that stuff usually provides very low fodder material / MCQ worthy info. So cost-benefit ration not good, hence skipped here. You can add more to this like RSS feeds of Indianexpress, financialtimes depends on your taste and time. but usually the news keeps overlapping. Besides sometimes technology feeds have useless stuff related to mobile gadgets. So makes it easier to weedout (when tech feed is separate, it doesn’t clutter the ‘whole sci-tech’). You can add individual writers, from here: http://www.thehindu.com/opinion/columns/ (click on names and then right click on orange colored RSS icon). You can add more to this list from Indianexpress, TimesofIndia etc. as well. 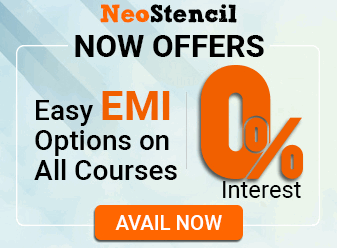 Their main purpose is to provide fodder material for Essay, descriptive papers and interview. but keep the cost-benefit ratio in mind. Some people consistently write well, others are bogus and some have never grown up beyond the era of Che Guevara and Fidel Castro. Observe for 3-4 articles then unsubscribe the irrelevant. Letters to editor are written by readers (who usually disagree with what was given in previous article/column!) So, they provide you different angle / dimension / viewpoint to the same news-story/column. Helps you see a bigger, bipartisan picture. Note: Sarkari naukri website gives alerts on vacancies in Central-State Government, universities and PSUs. Given the extremely competitive and unpredictable nature of UPSC results (at Prelims, mains and interview), you shouldn’t put all eggs in one basket –especially when you don’t have an IIT/IIM/CA/Doctor degree and have given more than two attempts in UPSC. pib.nic.in provides updates on Government schemes policies, recommendation of Committee, schemes, statements of PM/minister etc. So in a way it covers many areas: rights issue, public health, EnB, Sci-Tech, diplomacy. Ignore trivial stuff like appointment of new Secretary in telecom dept. Similarly the “joint statements” released after meetings with foreign leader / foreign summit= important. they provide you fodder for diplomacy/IR. Salient features of government policies and schemes should be noted down. Yes, TheHindu/Indianexpress articles will also give you the salient features of schemes/policy but they usually omit many points which may be important for exam but not so important for a journalist’s point of view. So whenever you want salient features of schemes/policy= pib. Similarly when you want salient features of act/bill=PRSindia. Bottom line: if something can be asked in MCQs or can be used as fodder for mains/essay/interview then it is important, otherwise ignore. Solve last 2 years’ prelim+mains papers (+ this year’s prelim paper) and you’ll see what information is worthy tracking and what information is worth skipping. This rule applies to all books, magazines, PDF, studymaterial, and websites. Prsindia’s old rss link wasn’t working, hence I’ve given new RSS link. PRSindia gives you highlight of bills, Acts and other polity stuff. Soli Sorabjee writes for Indianexpress. Sometimes unimportant stuff like Jazz and Music but otherwise good fodder for polity and judiciary related developments. For UPSC interview, you need to be up-to-date regarding the developments taking place in your state, city, district (=profile/location based interview questions). so add the RSS feeds accordingly. for remaing place, go to this page of Indian express www.indianexpress.com/rss/ locate your city / state and subscribe to its RSS feed. all newspaper websites provide sectional RSS (for individual topics like Economy, Sci-tech etc.). goto following pages and grab more if you need. Provides articles on English idioms, phrases, grammar. They do mockery of current news (particularly bashing Mohan and Rahul). Good read when life gets too stressful and serious. But use caution. Such websites are designed in a way that when you get to bottom of one article, it’ll show you list and photos of other funny/timepass articles and you can end up spending whole day reading stuff that has no application in exams. Self discipline is necessary. Try to spend your internet-time on productive reading, Don’t waste it on facebook, orkut, MP3, themes, movies, games and wallpapers. A new list of options is given. Click “no”, because exam oriented feeds are already subscribed. this thing occupies unnecessary space on our feedly homepage and gives useless breaking-news type articles like Vindu Darasingh and BCCI chairman’s son-in-law’s connections in IPL matchfixing. Delete whatever text is written here. Because it tracks share-market prices, hardly useful for exam. There are many other options, to change link colors etc. I suggest you play with those settings as and when time and mood permits. Whenever you select some phrases/sentences in any web/pdf article, this software copies it in a note. so when you combine this with RSS-reader, it becomes a killer combo. Works flawlessly with Microsoft XP (SP3). If you use chrome browser, you can directly save webpages as PDFs. In above screenshot, observe there is a button titled “Change” in the left panel. click it and select PDF. perhaps your printspooler function is has stopped. press Win+R key. “run” window comes. Scroll down the list and make sure printspooler is running. otherwise click on start/restart button on left hand corner of that window.